Landscape Artist of the Year,'Heat 5 "Stowe"'Artist Moy Mackay'� Chris Lobina / Sky Arts. Peebles artist Moy Mackay will put her artistic skills to the test in the sixth episode of Sky Arts’ Landscape Artist of the Year (LAOTY) series, which airs on Tuesday, November 15, at 8pm. Moy, who uses the medium of layered felted fibres to create her unique artworks, is competing against seven other professional artists challenged to reproduce a piece of art depicting Wray Castle, a National Trust property in the Lake District. Moy Mackay, who appears on Sky Arts' Landscape Artist of the Year programme on Tuesday. As is the tradition in such things, the result is a closely-guarded secret, but if she wins the heat, she will go on to take part in the semi-final that took place in Margate earlier this year and due to be screened on Tuesday, November 22. 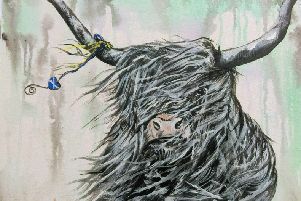 Moy – who has a gallery in Peebles as well as a studio at Wasps (Workshop and Artists’ Studio Provision Scotland) in Selkirk – said she was delighted to be a part of the show. She said: “It was a great experience going up against the other artists. “I only met the other artists at the beginning and then it was straight into the work. “I think most of the other artist were painters, but I did see one man who was painting onto silk, using his feet, as he had no hands. “And it was a huge production as well, much bigger than I was expecting. “It is one of my favourite programmes, so it was fantastic to be part of it all. This is the second series of the show, produced by London and Glasgow-based independent production company Storyvault Films. LAOTY first aired last year, following the enormous success of Sky’s Portrait Artist of the Year, also from Storyvault Films. Last year’s LAOTY was the best-performing non-scripted series of all time and second-biggest series ever for Sky Arts, with viewing figures growing over the course of the series. The judges who Moy had to impress were artist Tai Shan Schierenberg and independent curators Kate Bryan and Kathleen Soriano. The show not only highlights the tremendous artistic talent from every corner of Britain and Ireland, but also how the beautiful British countryside has inspired past and present generations of artists.